"My mother made this potato salad for me as a boy growing up in Spanish Fort, Alabama (on the Gulf of Mexico). I have re-created it with a slight modern tangy twist. I know you will like it! Best taste is achieved when the salad is covered and placed in refrigerator overnight. " 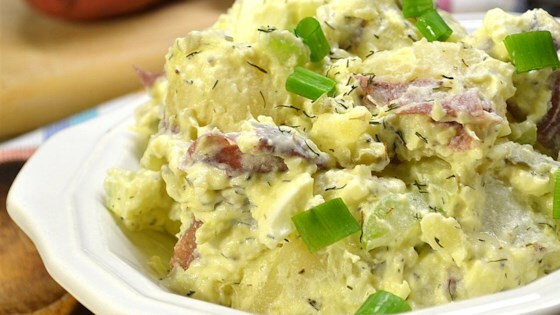 See how to make a Southern-style potato salad that you serve warm. Because of the reviews, I decided to make this potato salad to take to a cookout, and 2/3 of it went uneaten. What a waste! I followed the recipe exactly. This was the BEST potatoe salad I have ever made. I did not deviate from the recipe at all and it was FABULOUS!!!! !